Aye! Me bottle o'scrumpy! Anon! You demanded a Holiday update, and by gad, you're going to get it and like it, pal. We've cooked up a fine feast of new weapons, garnished it with more headgear than you have heads, and left it simmering overnight in a new game mode. What are you waiting for?! Get over to the Update Page and chow down! As you've probably seen by now, we like to change things in Team Fortress 2. A lot. And while we're perfect most of the time, we occasionally get something wrong. One reason for this is we just don't get enough data from internal play testing, and another is that we spend too much time watching Tom Bui serenades on Youtube (Hint: Search for "Tom Bui" on Youtube) (Another Hint: Click here). So to help us change TF2 even more frequently, we're pleased to announce the Team Fortress 2 (public) Beta. Our first attempt to play the ETF2L Highlander Exhibition match ran into some technical difficulties. This time around, we've been assured that the appropriate number of chickens have been sacrificed to the dark lord of the internet. You can find out all the details on how you can watch the match here. If you don't feel like firing up SourceTV, this time there are live streams as well. 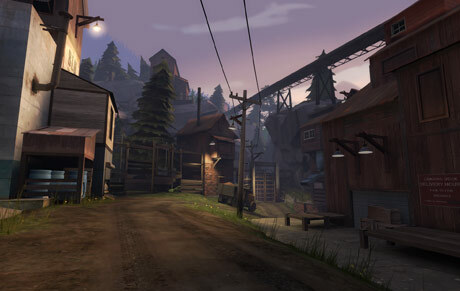 While we're here, yesterday we forgot to link to the first productive use of TF2. Check it out! Who wants some a this? We're getting a little slack around here on the blog posting front. In our defense, we've just had our second day of snow in Seattle, and that means civilization has pretty much broken down entirely. We were about to eat our last intern when we realized we wouldn't have anyone who knew how to operate the blog posting tool/machine/software/doohickey. Luckily the intern, bless his little proactive (and tasty) heart, wrote a detailed description of how to use it on the company wiki. Around here, we call that a Career Limiting Move. The game itself will continue to work. All players will have their default appearance and weapons. 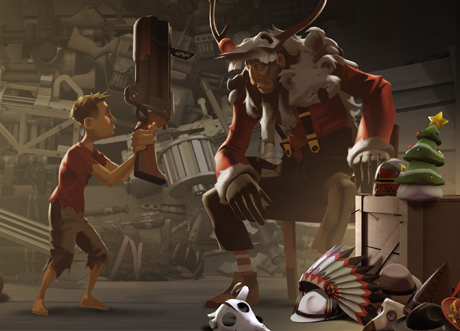 To keep abreast of the status of this and future TF2 item maintenance, subscribe to this thread in the TF2 forum. Note to developers using the TF2 Item Web API: As part of this maintenance all item IDs will change to eliminate negative IDs. We will be shifting all item IDs forward by 2100000. Depending on what data you store in your database, you may need to do the same. Poker Night at the Inventory is now available for pre-order. If you move fast, not only will you save 10% off the already low price, but you'll also pick yourself up a sweet pre-order bonus of this spiffy Poker Visor for your favorite Heavy. 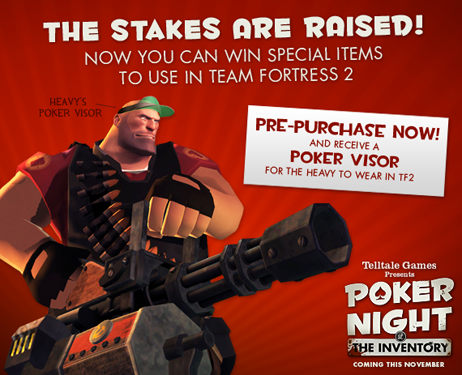 Once the game is released, you'll also be able to unlock new TF2 items by beating The Heavy, Max, Tycho, or Strong Bad at high stakes games of poker. This is pretty exciting to us - it's the first time a game made by someone other than us allows you to find TF2 items by playing it. If you'd asked us, as we slaved away on TF2 back in '63, whether one day you'd be able to get the Heavy's first minigun off him by playing poker, we'd think you were nuts. Then we'd have hired you, because you had a vision for the future. Two blog posts in two days? Your eyes don't deceive you. We're blog-writing machines this week, and there's plenty of gas in the tank. Today's update includes both of the Art Pass Contest Winners' maps: Mountain Lab by Valentin "3Dnj" Levillain, and Mann's Manor by Tim "YM" Johnson and Alex Kreeger. Also included in this update: You being scared! [sound of bat wings] That's right, it's the Second Annual Team Fortress Halloween Special. Will there be ghosts? Quite possibly. Will there be exploding pumpkins? You never know. Will you wet your pants in terror? If you're anything like us, emphatically yes. And what more perfect holiday than Halloween to add the scariest feature yet to the Mann Co. Store: Gift wrapping! If someone decides to trick or treat on your server, wrap up that spare bottle of Jarate and give them the gift a thousand words could never describe, and a thousand therapist appointments will never undo. 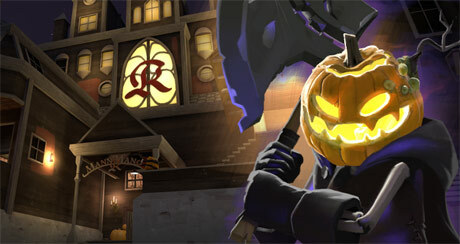 Also added to the store: new community items themed for Halloween and a few scary hats of our own dark design. Some of these new holiday items are only available to purchase during the holiday, but will remain wearable all year round, so grab 'em while they're grabbable.